Need a rugged, sturdy indestructible Android device? Look no further than the new Motorola DEFY. Motorola and T-Mobile bring a nice change of pace to the already crowded Android arena. The new DEFY is perfect for those that need a full feature phone that can be dropped, kicked, and submerged. Motorola is claiming the new DEFY is water-resistant, dust-proof, and super scratch resistant. 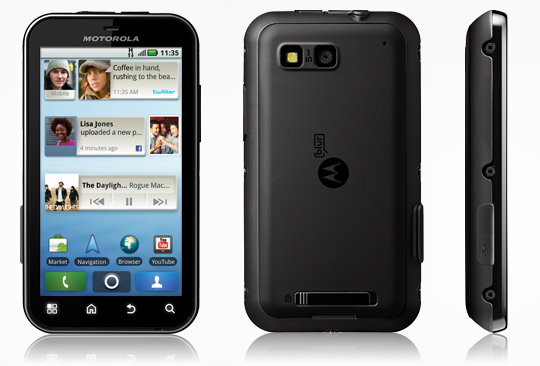 The Motorola DEFY will come equipped with the spectacularly famous Gorilla® Glass. T-Mobile made the announcement yesterday via Twitter. The DEFY comes packed with the standard set of Motorola tools including the latest version of Advanced MOTOBLUR 1.5. The biggest thing it seems to be lacking is the latest version of Android. The DEFY is said to be loaded with Android 2.1, and not Froyo. But I fully expect to the Froyo update come down the line very shortly. The DEFY will also come bundled with Swype as the default keyboard of choice. On the hardware side it’s a pretty standard picture. The DEFY includes a 3.7-inch WVGA capacitive touchscreen, exactly like the DROID 2. A 5 megapixel camera with an LED flash can be found on the back of the DEFY. It will be powered by the 800 MHz OMAP 3610 processor, the same one that’s being found on various other Motorola devices. 1.25GB on-board memory and the obvious microSD slot make up the storage capabilities on the DEFY. WiFi, Bluetooth 2.1, and GPS round out the rest of the specifications.